This page contains a character guide for Darkseid in Injustice 2. Here you’ll find movelists, combos, juggles, strategy guides and recommended gear for the DLC character. For more Injustice 2 content, head over to our Injustice 2 top page. Unto the hell that is Apokolips came Darkseid, malice personified, a merciless tyrant who demands unwavering devotion and abject fear from all his subjects. A being of unparalleled strength, he prefers not to sully his gloves with combat unless provoked to action. His eyes emit the formidable Omega Sanction, beams of energy that can disintegrate, teleport, or resurrect depending on the dread lord’s wishes. His sole mission in life is to find and gain control over the Anti-Life Equation, which would give him the means to usurp all free will in the sentient universe. Meter Burn R2 (must press R2 at the beginning of Omega Beams). Darkseid opens a Boom Tube and summons a Parademon from Apokolips to assist him. Below are combo and juggle inputs for Darkseid , including corner strategies and restarts. Although Darkseid is in the console versions of the game as a stage transition appearance, he does not wear the same costume in the Mobile version. Instead, he wears a completely different costume. 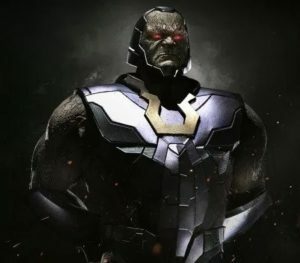 Darkseid is the only playable DC character from Mortal Kombat vs. DC Universe to not reappear as a playable character in the console versions of Injustice: Gods Among Us, he is instead merely a stage transition. The name of the Darkseid’s move “I Am Many Things” is a reference to his quote in Superman: The Animated Series, “I am many things, Kal-El, but here…I am God.” It visually resembles both Ares and Martian Manhunter’s supermoves, as both involve them teleporting their opponent and then attacking them in a giant form. Darkseid’s appearance in the Year Four comic is redrawn to strongly resemble Darkseid from the mobile game, and also uses a simplified version of his Super Move against Superman.